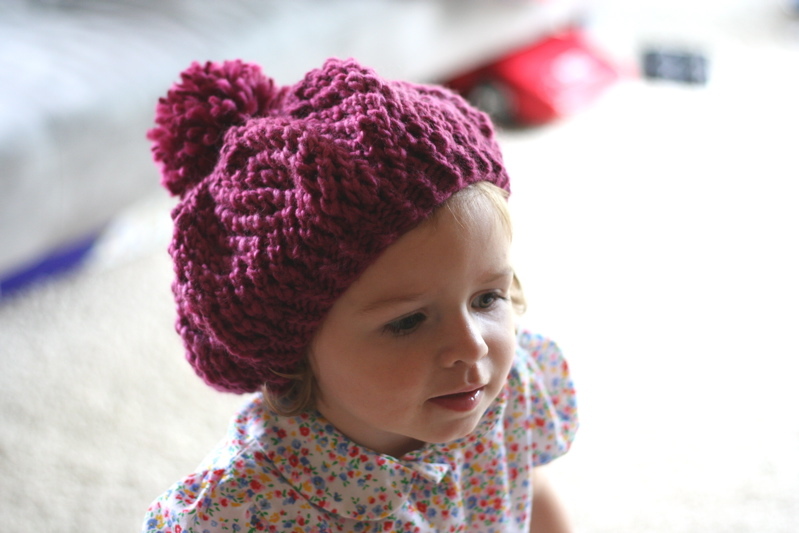 it’s this pattern here, with a pom, knit in saphira yarn. I know it’s an adult pattern but I think my yarn wasn’t as bulky so it seems to have worked out okay. it’s sort of a slouchy beret thing on Phoebe instead of a more fitted hat like it’s supposed to be. I wish someone would write a knitting pattern book of all hat patterns for kids done in bulky yarns. that’s all I ever want to knit. If you’re on ravelry, you can certainly do an advanced search. Something like this: http://bit.ly/4b5J1G should get you some ideas! Lovely to see what the yarn in your previous post became! Its gorgeous. Gah! That Pom-Pom! My heart just stopped. I have to go make this. I like it that way, she looks so cute. Mais oui Phoebe. Love the color and the pattern of that hat! She is very adorable. 🙂 Have a lovely merry happy day and love to you! Great hat. I agree totally about needing a book for children. I have the just hats (I think that’s the title) by lion brand yarns. 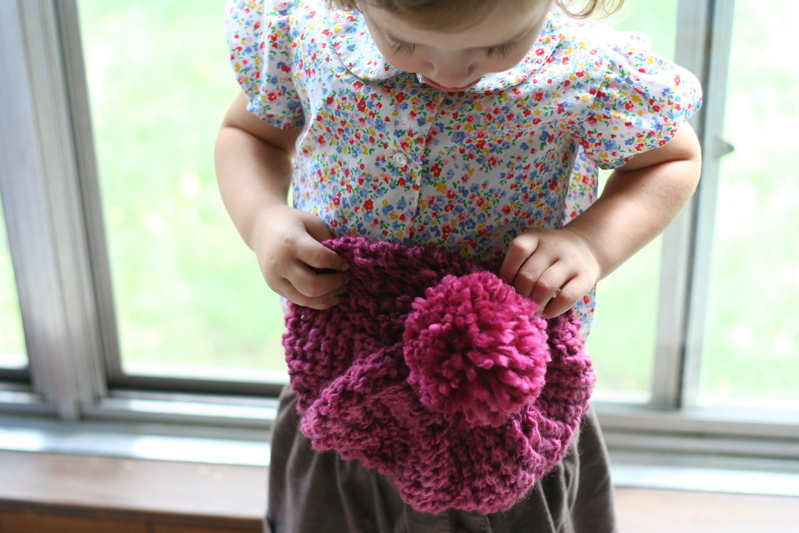 I followed a particular pattern adaption for children to make my daughter a winter hat. It looks more bucket than it’s supposed to and it’s way too big. But I followed the directions. That just irks me…to spend time on something we then can’t use. A kids’ sizes book. Oh please! its gorgeous — that color is so warm and snappy. it looks just right on her. Love the pom. Looks cute on her! Just gorgeous! The color and texture are amazing. Love it! Love it! It fits her very well. She looks more adorable on that hat. Cute! I love “this year’s purple hat” ~ it’s like a title to a children’s picture book and your sweet daughter looks so precious in her purple beret! I’m a retired teacher, and I’ve been reviewing some of my favorite children’s books this week, and I wondered if you or your readers might be interested in a particularly wonderful children’s picture book that has just recently been reissued. oh thats such a lovely colour! and phoebe looks so adorable in that outfit. such a sweet little girl. The baby looks so cute in that purple hat. I love looking at it. So cool!!! What a sweet little girl.I wish her blouse would fit me.